What’s behind the poor play? Are you ready to find out? I played tennis this week with a friend whom I haven’t seen since our last match together, back in the winter when emotional issues were affecting my game. In fact, the last time we played together, I felt like such a failure I considered quitting tennis entirely — it had ceased being fun for me, and I was letting my partners down by inferior play. But this time, things felt different. I still made mistakes, we still lost our match, but I didn’t come away with the sense that my partner would never speak to me again, nor that I had performed so miserably as to discredit the sport. While there were moments where I double-faulted or missed an easy shot and started to panic, I was able to settle down and focus on the next ball. I even felt strangely calm when serving or returning serve on “pressure points” like “ad-in” – moments where winning or losing the point can decide the outcome of that game. In spite of these improvements, though, I’m still not winning matches. But this is a journey, in my case a long one, and at least I’m taking a few steps forward. From my current vantage point, I now understand how strongly my attitude correlates with how I play tennis. Knowing this, I see that what I needed a few months ago was not more tennis tips to pull me out of a slump, but a partner who could step over court boundaries and be a true friend. I’m not blaming anyone — since I hate to let on that anything’s amiss, others might not even see that I’m having a bad day. I’d prefer to give the appearance that all is fine, and I shy away from exposing vulnerabilities with anyone but family and close friends. However, I’ve learned from this and other experiences that not only do I need to be more open about wanting others’ help — I also should be on the lookout for people who might need someone to pay attention to them. I’m 50 years old today. Some of my friends assumed I was 50 a while ago, others have teased me by asking, “Are you ever going to turn 50 and catch up to the rest of us?” and of course my daughter is happy to name other moms who are older than me but look younger. Now that I’ve arrived, however, this big birthday seems to be worth all the fuss. Fifty feels more like MY birthday than 40 did. I turned 40 amidst the hubbub of school-aged kids, pausing between math tests and basketball games to blow out my candles. But now, two of my children are in college and the third one will be leaving in a year and a half. So I’ve stopped organizing my days around kid doctor visits and afternoon carpools. I’m back to counting years by my own age, not by the ages of my children. Now that my child-rearing job is winding down, I get to look for my next gigue, explore options for something I can throw myself into with passion and energy. That describes the good days, of course. On the bad days my knee hurts, I can’t remember the name of someone I’ve known for years, and the print on labels shrinks and goes fuzzy. I miss having children in the house, miss feeling needed, miss having a role like “mom” that imparts purpose to my life. As my Austrian friend Andrea might say, I survey age 50 with “one laughing eye and one crying eye.” There’s a lot to celebrate, but ignoring the sad parts devalues the happier times. Having lived through hard days helps me appreciate the easy ones. Designers are right about more than aesthetics when they offer the advice that vivid colors “pop” if put you put them against a black background. At 50, I’ve lived more than half my statistical allotment of years here on Earth. On the other hand, I may just be reaching the halfway point of adulthood. It’s time to stop looking inward — mourning my youthful independence, my child-raising years, the career I put aside for other priorities. And to start looking outward — to see where I can contribute to something bigger than myself. My tennis coach reminds me to “turn the camera around” and watch what my opponent is doing so I can anticipate what kind of ball will be coming for me to hit. The point is to notice what’s happening outside my control, and to prepare for my next move, my next shot. I want to look forward to another thirty, forty or more years of life — but more than that, I want to keep looking outward, to keep looking towards the future. So I remember the past fifty years, grateful for my family, friends and the experiences that have shaped my journey thus far. At the same time, my intention for the next phase is to continue watching and learning. Most of all, I plan to keep moving forward. I’m counting on you, my friends, to hold me accountable. Ready, set, go! With my sister on our way to church. Not hard to tell us apart! 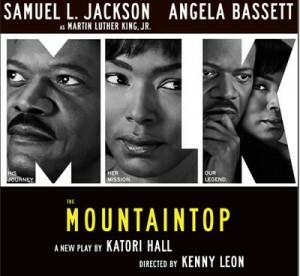 While in New York recently, I had the chance to see “The Mountaintop,” a new Broadway play set during the last hours of of Martin Luther King’s life. It’s an excellent two-actor production with Samuel Jackson and Angela Bassett. The show goes for ninety minutes with both actors on stage the whole time, no intermission. Not only was it fascinating to attend a Broadway show where probably half the audience was African-American; the play also offered a humorous, at times irreverent and also moving portrait of MLK’s life within the context of the civil rights movement as a whole. The experience caused me to reflect on the value of a human life, and the contribution a person can make during his or her lifetime. Oddly enough, Angela Bassett, my husband, and my husband’s roommate David all were classmates together in the same residential college at Yale. Now 53 years old, Angela might be said to be at the top of her game. For others such as David, however, the game is nearly over. David has been fighting cholangiocarcinoma, a cancer of the bile ducts, for nearly five years now. Although he has outlived all predictions, his time on earth is growing short. Yet who is to say that his life has any less meaning overall than Angela’s, or my husband’s, or King’s, or mine. To David’s family, his contribution is enormous and long-lasting. It may not touch as many people as someone else’s life does, but the impact is substantial all the same. So here’s the lesson I take away from juxtaposing these classmates’ lives, thirty-odd years after their graduation. In my ongoing question, “What do I want my own legacy to be?” I need to worry less about what I’m passing on, and more about the here and the now. I don’t need to collect a precious set of china or leave other “stuff” for people to discover after my death. No, much better to get out into the world now. Better to let people know they matter to me, and to work to change the things that seem wrong. I have to remind myself not to “major in the minors,” as a friend says, but to stay focused on the things that count. My kids may inherit nothing but chipped plates and teacups from their mom, but at least they will know she tried to find ways to get involved, to make a difference. Addendum: David died on November 5, 2011. His life was far too short, yet his legacy cannot be measured. The Washington Post published this obituary — it enumerates accomplishments, but doesn’t describe the person his friends and family will miss.